Dandruff is the condition when dead skin cells drop from your scalp. Do not be anxious, it is quite obvious and happens with almost everyone. When skin cells died, they naturally shed. However, dandruff has been considered as a common scalp disorder as it affects your hair. So today a discussion will take place here about the causes and the potential home remedies for dandruff. Missing some nutritional element from your regular diet such as Vitamin B, Zinc, etc. For a lot of people, it’s really common to think they have dandruff, when what they’re actually experiencing a dry scalp. The difference between both is that you’ll notice dandruff in your shoulders, and your scalp will have a scaly, greasy look. Your scalp can also have a yellow or white coloration. Also, you’ll see that the oily flakes fall off really easily. Another thing people often mistake when presenting this symptom is lice. The itchiness and white flakes are the one thing they have in common. So make sure you use a comb or have someone else (a professional is better) to check your scalp and identify the bodies that are in your scalp. And really dry or oily skin and skin yeast can be associated with dandruff. Something that you can use to identify if you have dandruff is genetics. If your parents/grandparents had dandruff when they were younger, chances are you can have it too. Adolescents and young adults are more typical to get dandruff, but older adults and babies can also have it. Indian Lilac: Neem is the local name of Indian lilac. 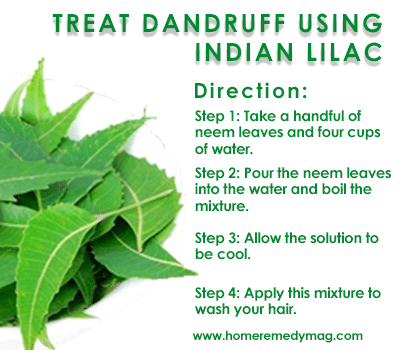 The antibacterial and anti-fungal properties that are present in Neem help to treat dandruff naturally. It will also help you to cure itchy scalp, hair fall, and scalp acne. Step 1: Take a handful of neem leaves and four cups of water. Step 2: Pour the neem leaves into the water and boil the mixture. Step 3: Allow the solution to be cool. Step 4: Apply this mixture to wash your hair. Note: Do this method at least twice a week for getting rid of dandruff. 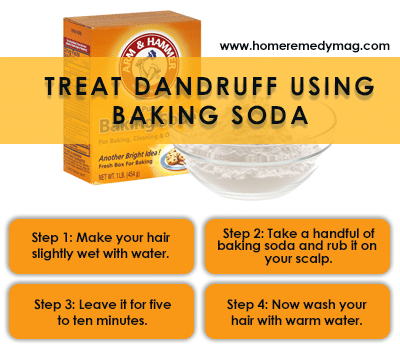 Baking Soda: Baking soda is one of the best home remedies for dandruff. It will lessen the fungi that cause dandruff and also balance the pH level of your scalp. Step 1: Make your hair slightly wet with water. Step 2: Take a handful of baking soda and rub it on your scalp. Step 3: Leave it for five to ten minutes. Step 4: Now wash your hair with warm water. Note: You need to apply this method at least twice a week for getting the best result. Do not use shampoo to wash your hair after the process. 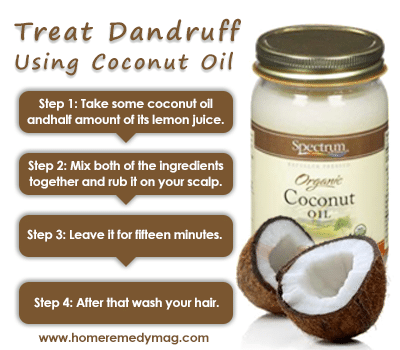 Coconut Oil: Coconut has the natural anti-fungal properties that help to reduce dandruff. Apart from curing dandruff, it also provides relief from itching and moisturizes dry scalp. Step 1: Take some coconut oil and half amount of its lemon juice. Step 2: Mix both of the ingredients together and rub it on your scalp. Step 3: Leave it for fifteen minutes. Step 4: After that wash your hair. Note: Apply this method at least twice to thrice a week. You can use shampoo for washing your hair after this method. White Vinegar: White vinegar consists acetic acid that reduces the growth of fungi and provides relief from itching. 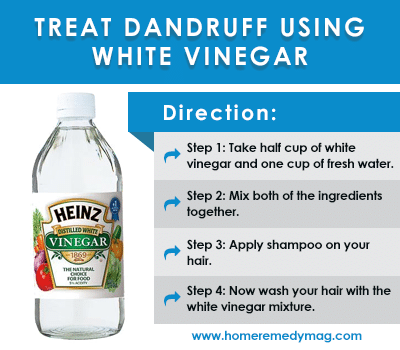 That is why white vinegar is one of the best home remedies for getting rid of dandruff. Step 1: Take half cup of white vinegar and one cup of fresh water. Step 2: Mix both of the ingredients together. Step 3: Apply shampoo on your hair. Step 4: Now wash your hair with the white vinegar mixture. An alternative process of applying vinegar: Prepare a mixture of one part of olive oil, two part of white vinegar and three parts of water. Use the mixture to massage on your scalp for five to ten minutes. After that, use shampoo for washing your hair. Note: Apply either of the methods at least once a week. Extra-Virgin Olive Oil: Olive oil has the natural properties of moisturizing your scalp. A regular use of olive oil will reduce the dryness of your scalp as well as dandruff. Step 1: Take some olive oil and heat it slightly. 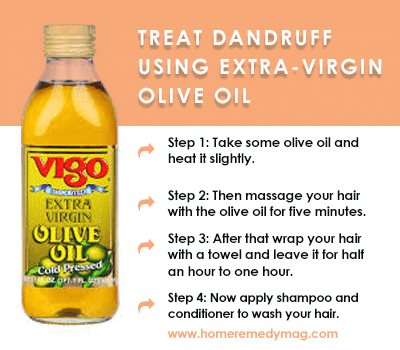 Step 2: Then massage your hair with the olive oil for five minutes. Step 3: After that wrap your hair with a towel and leave it for half an hour to one hour. Step 4: Now apply shampoo and conditioner to wash your hair. Lemon Juice: Any lemon juice consists five to six percent of citric acid. This amount of citric acid helps to fight against fungi. Fungi is the element that causes dandruff. 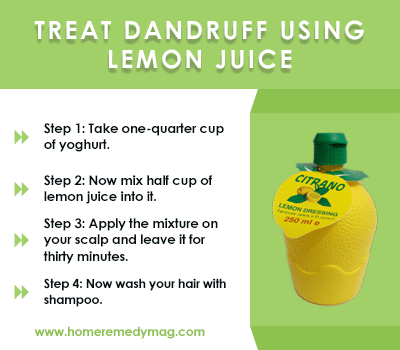 Lemon also provides relief against scalp itching. Step 1: Take one-quarter cup of yoghurt. Step 2: Now mix a half cup of lemon juice into it. Step 3: Apply the mixture on your scalp and leave it for thirty minutes. Step 4: Now wash your hair with shampoo. Alternative method: Take two tablespoon of lime juice and mix it with lime water. Massage your scalp with the mixture and leave it for ten minutes. Now use shampoo to wash your hair. Note: Do either of the methods at least twice a week. Tea Tree Oil: Tea tree oil is one of the best home remedies for dandruff, because of its natural anti-fungal properties. 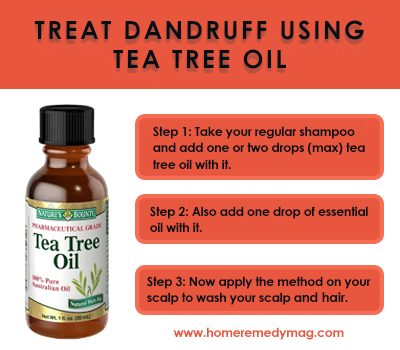 Here are the process of using tea tree oil for getting rid of dandruff. 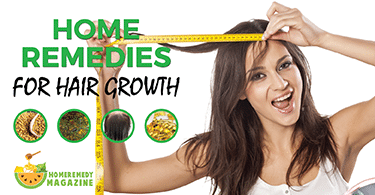 Step 1: Take your regular shampoo and add one or two drops (max) tea tree oil with it. Step 2: Also add one drop of essential oil with it. Step 3: Now apply the method on your scalp to wash your scalp and hair. Alternative method: Take your regular hair oil, add few drops of tea tree oil into it. Now apply the mixture to rub on your scalp. Leave it for thirty minutes or overnight. Now wash your hair with shampoo. Note: Repeat either of the methods twice a week. Use Tea tree oil to get rid of lice. Babies can also experience dandruff, and while it is harmless for them it can also be annoying. A great way to do this is to use baby/mineral oil or Vaseline in the places where you see dandruff and let it sit for 15 minutes. Then use a mild baby shampoo so it’s easier for you to remove the scales and the product. Massage well and rinse with water and brush out the flakes with a soft brush. Using natural remedies can also be really helpful if you don’t want to use oils on your baby’s scalp. Apple cider vinegar and baking soda can really come in handy to prevent the appearance of bacteria and/or fungus. In this case, use a fine-toothed (such as lice one) comb and comb the hair. Finally, wash out any remaining mixture using a mild shampoo that doesn’t irritate the baby’s skin. If the symptoms persist, please seek professional help. If nothing works and/or your baby’s scalp has signs of infection (bleeding, pus, extreme redness, pain, or fever) is always better to have someone that knows about the subject examine your child. Also, avoid using any not prescribed medication such as salicylic acid shampoos. You should also consult a doctor before applying any remedies that claim to be great for getting rid of baby dandruff. So these are the seven best home remedies for dandruff. It is not necessary to visit a doctor for getting rid of dandruff or scalp etching. 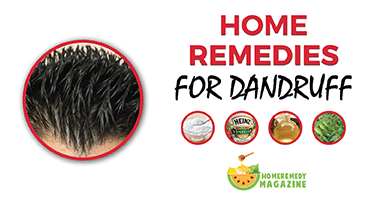 Dandruff can be treated by any of the above homemade tips.